Please allow up to 48 hours for your comment to go live. We review all comments before processing. Thank you for your patients. Listening to Ray’s story telling, I am right there with the Brits in the Summer of ’41, shaking my fist at the sky when the Heinkels flew over. Wish I was 19 and a pilot back then…I woulda murdalized ’em! I agree that everyone wishes sometimes that they could go back. Do you have any family stories or tales from WWII? A few years ago, a Polish fellow using a metal detector at the site of Stalag Luft 7 found my father’s dog tags. He called my house thinking I was my father. Told me in a thick accent, “I have something you lost.” Wow. Turns out my father threw them off because he heard the Nazis will call your Mother. True. I’m a Dental Prosthetist in Australia. (Fabricate Dentures) I have a lot of DVA patients. (Department of Veterans’ Affairs (War Veterans)) Some of them do talk about their time in WWII. The stories I hear move me and amaze me. These guys were men when men were men. One of my patients tells me a story where he was in a mission on beach in Europe. They landed on the beach at night. He said it was pitch black, was an overcast night and no moon out. They were lying on the beach waiting for their next command, when all of a sudden the skies lit up. He said there was so much light from bombs and gunfire that you could’ve read a newspaper. I asked him what did you do? How do you handle something like that? He just said, we just followed the command, we picked up our guns and began to attack inland. I personally can’t relate or even imagine being in such situations. It was the UK, along with France, that declared war on Germany even though not threatened by it. So Hitler turned west, as he was only going east eventually against Russia, to deal with the UK and France, then return to face Russia. A defector from Russia (ex-intelligence officier) Victor Suvorov contended that Stalin was planning to attack Germany (Youtube and books). It was the UK that started the carpet bombing of civilians so your point ”.. when the Heinkels flew over.” was in response. Read ”Churchill, Hitler, and “The Unnecessary War”” 0307405168 in which it describes how Churchill was a warmonger and responsible for the unnecessary deaths of millions of English speaking troops in both WWs, UK bankrupcy, near starvation and loss of empire after WW2. My grandfather on my mothers side was in Italy, Egypt, North Africa and Germany (at the end of the war). He had lots of stories from the war not all of them horrible and as a young boy I loved to hear him talk about him time during the war. My great uncle was in Burma (the forgotten army) and was captured by the Japanese. He eventually made it home via India 3 years later as his aunt married a tea plantation owner. I can give you a more detailed account if you are interested. I am an avid listener to you podcasts. I\’m a Brit working with vulnerable communities in very rural part of South Africa, and whilst I have no TV and only spasmodic internet access, the first thing I do when it is available is download your latest episodes. Im in my mid 50s, but my parents يلا شوت were married during the war. gamf.net My mum, living in London, became a Air Raid Warden by night and worked in a munitions factory by day – sadly with the outbreak of war she gave up her blossoming salt dough handprint carer as a model. My father served in the Royal Navy as did his anagazawe.com two brothers, Jimmy, his eldest brother was on the RN Hood when it was sunk by the Bismark and sadly died. Whilst growing up in the 1960s my parents talked about the war and their experiences of maintaining a relationship during such uncertain times, especially with both families living in London. My dad seldom spoke of what he saw and experienced in the navy, but he would never, ever allow myself or my brother to have a toy gun in the house, always maintaining that he never wanted to see a weapon of war and violence in his house. As I small child I didn\’t really fully understand this – but have understood as I grew and learned more of WWII. Over the years I have traveled extensively in Europe so equally enjoy how the war evolved across Europe. Your podcasts give me further insight into the war and, even if you do mispronounce British place names, and as for the German and French well…. which makes me smile, I cannot gloat however as I am always embarrassing myself attempting to speak and pronounce Zulu with all its clicks and docks! I never knew my grandfather, though he survived the war, or any details about him until a couple of years ago. My dad looked into his dad’s service history through Information and Records at the Australian Army. They were able to provide his Enlistment record, Service and Casualty form and discharge papers. Not a lot more is able to be found, but from these my family was able to find out that he served from ’41 – ’45, training in Darwin, spending 1 year serving in Papua New Guinea and 6 months in the Solomons. At only 17 years old and barely 5 foot 5″, he’d tricked his sister into signing his date of birth as 2 years early, falsifying his age, making him 19. This is just another glimpse of the spirit of courage and adventure that drove these young brave soldiers. Recently, my wife and I travelled to the Solomon Islands (an adventure in itself) and discovered so much about the importance of the battles fought there and the sacrifices made by Australians, Americans and Pacific Islanders to fight back the terror of the invading Japanese. The history there is still raw, the wrecks are still scattered on reefs, in jungles and the natives are still very, very native. Getting around the islands, it is easy to imagine a soldier’s adrenaline pumping as Japanese bullets whizzed through jungle tracks in the searing humidity. You can smell the impending tropical disease in the air. Snorkelling the naval wrecks or looking over the bay towards Savo Island you can imagine the carnage of the sea battles around Guadalcanal as fighters, bombers and naval destroyers fought for control of the port and the Henderson airstrip, a critical stepping stone for the Japanese to launch air, sea and invasion forces against Australia and island nations. It’s an experience I’ll always cherish, and more so, knowing my grandfather stood on those shores and somehow contributed to the defense of the free world! You podcasts are simply amazing. I wish they were on the syllabus for all kids at school, they need to know all this. Among the millions of stories, most never told, silent acts of bravery and love, cruelty and evil , my great grandfather Capt Henry CBE, who I never knew, I only read about in this book. He and a few other brave men stole supplies from meant for the nazis and ran the gauntlet to bring them to Britain. They risked everything. My Grandfather was on a train at Dunkirk that was bombed. Luckily he survived, was shipped back to Scotland and spent the rest of the war there. Lucky for me as I would never have been born and been able to listen to these great podcasts! Just kidding Ray – great podcast, and great site, I’ve been following the podcast from almost the beginning, I know get my history fix here now that the excellent ‘History of Rome’ podcast has sadly ended. 1. My Grand dad, I knew had served in the Royal Navy during WW2, though, like many he didn’t speak of it. Even when I, the first male in the family for two generations, joined the Royal Air Force in 1984. It wasn’t till he neared his end, riddled with cancer, about 10 years ago that he told of some of his experiences. He was both at Dunkirk and, as a bosun, on a landing craft, at D-Day. Though, his most traumatic memory occurred a few weeks before D-Day. A dry-run was arranged on the south coast of England at Slapton Sands. Thousands took part in a dummy run of the landings, and thousands died when E-boats suprised those taking part, including many on the large US landing ships. My Grandfather’s memory was for a much smaller craft. A landing craft, though not fired upon, had panicked, rushed back to shore and flipped over on the beach. All crew accounted for apart from one young crew member. the tide was coming in, they could have cut the underside of the boat to see if he were alive, but every boat was precious, more precious than one guy. So, they didn’t. The tide came in and the lading craft was submerged. My Grandfather was an engineer working for the BBC when in August 1940 he was commissioned as an officer by the RAF to work with Radar, initially I believe in Leighton Buzzard. His work took him all over the country to work with Radar stations and he was given command of a ‘whaleback’ RAF motor launch. He skippered this craft in the D Day invasion moving between the Radar ships that crossed the channel to direct the allied air forces at the Luftwaffe as they took off. I have really appreciated Ray’s coverage of Radar and its vital role in the war, though its not glamorous to talk about its expert usage saved countless lives. My grandfather was a Lancaster bomber pilot and Canadian squadron leader – he flew a diversionary raid against the V2 rocket site as the dambusters took off. My grandmother had a photo of him with Guy Gibson. Thank you very much, you are doing the world a great service. My wife and I just lost her great uncle who piloted 33 missions in the Pacific during WWII. He flew a B-24J. 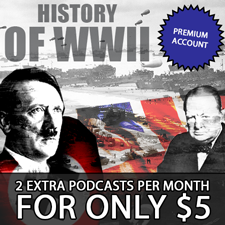 This podcast is a great way to dig deeper into WWII history. Keep up the Exceptional Work! First of all love the podcast. I have couple of very little stories from a friends dad and my great uncle. Not as significant as some of the others posted but personel non the less. The first from my friend father is that he was with in Africa and saw Rommel through a pair of binoculars. Rommel in the front lines is not an uncommon story. The second from my late great uncle who was working with radar in Darwin when it was bombed by the Japanese. Diving for the nearest cover he launched himself in to what he thought was a slit trench but was in fact a latrine. To which the comment was made better s*#t than shrapnel. Scott, too bad they didn’t have a good sniper nearby. I found your site yesterday…Already on episode 6….I look forward to listening to all the episodes over and over. Will there be an app to follow? Well after catching up I have finally gotten around to looking at the website and Facebook pages. Great show Ray, much thanks! I’d just finished listening to Sand, Saltwater and Oil was doing some work on the family tree and found a distant relative when I went off on a tangent who was involved. Sir William Eric Halstead Scupham is my 2nd Cousin 4 times removed. He started off as a Private in WW1 as an infantryman, was commissioned 2nd Lt and moved into these new fangled things called Tanks. He quickly became a Captain and commanded a tank section at the Battle of Cambrai in 1917 (400+ tanks took part) and got the Military Cross and ended the war a Major. After this he joined the Civil Service and served in the African Colonies. He was made Administrator of Somali-land after the Italians were pushed out for the period 1941-43 and was re-commissioned as a Brigadier but am not sure if he saw any service or was just essentially a Military Governor of sorts. He then got his Knighthood in 1957. Happen to be living overseas in Germany. I have a weekly long road trip to do and have enjoyed listening. I am only on episode 19. But I can’t wait to revisit some cities thus far mentioned – like Berlin. Really like all the explanations of what was happening behind the scenes. I don’t have the time right now to read the long history books, but your podcasts are giving me a really in depth look. My grandfather Frank (mother’s side) served in the 9/12th Lancers, throughout the Desert war and in Italy, where he was captured in 1944. After being released he left the army and married his pen friend, my grandmother. A year later my mother was born and sadly my grandmother died of TB. We are unsure of the reasons, but after seeing constant action, followed by captivity, then release, joy of marriage, first child and then loss of his wife, these events lead to what we might now call post traumatic stress syndrome. For most of the rest of his life he lived in care, whilst my mother was raised by her extended family. Although Frank lived until the late 1990’s, he would not talk of his war experience so we never new of what had happened that might have contributed to his condition. Then just 2 years ago mother read through a box of POW postcards that Frank had sent home. She felt compelled to know what he had experienced and feel closer to her father. As a family we discussed what we might do. We had very little to go, just a broad range of dates that suggested he was a POW. A little internet search lead us to the regimental museum and the war diary. This was very vague, the diary’s detail depended on how pressured the unit was at the time. However there was an entry that fitted the time window that we had identified that mention a Lieut “X” and 2 other men had gone missing and local civilians had reported seeing them captured. It was a very slim lead but we decided to search for Lnt X on the ancestry website. Not only did we find somebody, that actuall lived, but when we wrote to them, it was the very same Lnt X. A delightful man who was very helpful and agreed to meet my father. As it turned out he remembered Frank and was able to explain what happened. There were on a morning foot patrol (we had assumed as Frank was in a tank crew, he was knocked out, maybe experiencing the deaths of his comrades) and looking for fresh eggs, approached a farm house where they saw a woman hanging out washing. This was close to a river that marked the front line with the Germans, which had been static for sometime. As they approached, they suddenly came under machine gun fire from the farmhouse, upstairs window. They took cover in a shell hole but were pinned down and after several attempts to withdraw, they were offered the chance to surrender from the German unit. They were taken prisoner in the farmhouse and at nightfall were taken by raft across the river. The German patrol had been sent across to take prisoners for intelligence gathering, however when they were on the German side they were separated and Lnt X did not see Frank again. This came as some relief to mother who finally knew what had lead to the capture and the experience could have been more horrific. However our discovery did not end there. My father managed to get copies from the museum of the military maps of the time and Lnt X was able to pinpoint the location of the farmhouse…..google maps did the rest! The farmhouse still stands and we were able to see ground level images of the building, the field alongside and the river they were taken across. It put us right in the place it happened. So this is how we came to learn, from knowing almost nothing, to the full illustrated picture of my grandfather’s capture, although we may never know what happened in captivity. Both of my grandfathers served during the War, on my dad’s side as the commander of a 40mm bofors anti-aircraft gun and on my mother’s side as a MUG “Mid upper gunner” On a Halifax bomber with bomber command. My mums father passed away the year i was born so a lot of what i know of his service was found though an extensive search of his war time logs and records. He flew in both the pacific and in Europe at the end of the war, and we were shocked to find that he had been twice shot down by the Japanese and forced to trek back through the jungle for 2 days back to friendly lines. My grandfather plane had also be given a mascot by the crew, a small gremlin which had apparently appeared on a war time advert, my uncle still has “R” gremlin which was knitted by the pilots mother 70 years later. My dad’s father used to tell me a few of his stories; he was stationed on Malta during the siege and later fought in italy. He told me once how during a raid by a large group of Ju-87 stukas he was sure his time was up, One came screaming down towards his position, he saw a huge black object drop from the plane as it pulled up sharply, suffice to say the gun crew scattered and tried to seek cover in the few seconds they had before it landed. There was a huge crash and then nothing. My grandad kept his head tight to the floor thinking it was a delayed action fuse on the bomb. It wasn’t until a few minutes had passed that the platoon commander came over yelling why the gun was silent and they were all lying on the floor. They quickly explained there was a bomb feet away. The platoon commander looked around and saw no bomb just a pile a broken electronics. What had actually happened was the stukas engine had been hit and the radio operators had thrown his radio and other loss equipment out to try and lose weight and in the process scared everyone to death. He would also tell me how when the few supply ships made it in the first thing they would eat from their rations was a small tin of rice pudding. Whenever we went out for a meal he would always want rice pudding for his desert. He could also never see food wasted due to his time on malta when food was in such short supply he had to tie his trousers up with rope as his belt couldn’t go tight enough even with the extra holes he had punched into it. My grandfather on my mothers side fought in the Burma campaign, a soldier in the Chindits regiment. He was very young when the war broke out. Coming from a naval family his first instinct was to enlist in the RN and attempted to lie about his age in order to join. His lie was uncovered but was then successful in joining the army! I guess they were desperate for the manpower for the far east campaign. He worked as a driver/mechanic in the dense jungles. Eventually he suffered a shrapnel wound and was captured by the Japanese. He then suffered horrifically along with many of his friends in a POW camp, caught malaria and was tortured. At the end of the war he was repatriated although many of his friends did not return. Most of what I know of his story was told to me by my grandmother. He very rarely spoke of any of his time in the war, though he did tell many travel stories, having seen most of the far east. As I have grown older and studied history myself I still cannot begin to comprehend the suffering my grandfather and his buddies must have gone through. I’m really enjoying the podcast. My own family history with WWII isn’t so exciting. My maternal grandfather was an officer in the navy, but my understanding is that he didn’t see too much action in the Pacific. I think his job was fuel and supplies. After the war he stayed in the navy and was stationed in Japan and liked to throw parties for Japanese students learning English – for intercultural understanding and because he liked to have parties. But my wife is from Russia – from Kaliningrad actually and both her parents were born just before the war (obviously not in Kaliningrad). She has some stories. One of her uncles was in a German POW camp. They sterilized him and honestly I’m not sure how he survived after the war; my understanding is that Soviet POWs didn’t have much chance returning to Stalin. Her mother described being so hungry during the war that she found some old piece of whatever behind some furniture and got sick eating it. Her mother would tell her to distract herself by dancing if she got too hungry. But her father was from Tartarstan and since he could speak Tartar as a child, the adults favored him and he didn’t get too hungry. There’s a hell of a lot more to tell about with her family, but I have to go shovel snow. do you plan something on D-day. I know that there is a lot writen about D-day but mayeby you cloud make a special series of casts. I have just caught up with all your episodes now in the less than a month since listening to the first. Even though I thought I was reasonably knowledgeable about WW2, your podcast has shown me how little I knew and I am eagerly awaiting any new material you put out. My father was one of the early evacuees in the war moving out of Harwich to live in thornbury along with his brother. I always wondered why Harwich was evacuated early on but having listened to the number of times you mention it (even if you did butcher the pronounciation :)) I know realise it was a key strategic naval location. keep up the brilliant podcast. Really enjoy your podcats while driving (which I do a lot). Just wanted to share our experience in 1977 when my wife and I crossed the Channel by Hovercraft and rented a car in Calais. We drove east up the coast to Dunkirk. This was my first real tangable encounter with WWII history and I wished that I had paid more attention in my high school history class. The sheer size of the beach and envisioning all of those soldier evacutaing France was mind numbbing. Work was being done in the harbour which we could see from the beach, to remove a German bunker. They had to be excavated and lifted from thier position as blasting was not effective. We left Dunkirk and proceeded east toward Oostend along the coast and stopped along the way to walk into an actual bunker still standing guard over the English Channel that had been left to the elements all those years. I feel lucky to have had the opportunity to experience these places at that time as I am sure that by now all has been cleaned up or has been made inaccessible to the public. As I said, I wish that I knew then what I know now for we missed so many opportunities to visit signficnat landmarks from both Wars. We were young, foolish, and fancy free. We look forward to a return trip in the next few years. Being Canadian I will not miss the opporunity to visit Dieppe as this town holds special meaning to all Canadians. Have you heard of the connection between the Dieppe Raid and the Enigma machine? Thanks for keeping up the podcast as much of what I know now has been learned from you. My neighbor and good friend was in the Navy during WWII. He never did say much about his time but one day he brought me a video and ask me to watch it. The video “The Ship That Wouldn’t Die” was a documentary about the Franklin, an aircraft carrier. I watched it and then called my friend and he told me he was on the Franklin both times it was hit. I had a complete new respect for my friend. Thanks again for the podcast. My mother was in the first class of WAVES to graduate. She served in Washington DC throughout the war in the offices of the Judge Advocate General. She laughed about strolling around downtown DC with “Top Secret” papers she delivered to various offices. She also commented on the number of ships that collided around Iceland due to drunken mishaps. She knew, because she typed up all the reports. Sailors! What can I say. My dad was a Chief Boatswain’s Mate on the USS Washington from the time it hit the water. He never talked much about what he saw. He remarked on the noise and general confusion of many of the battles. The one battle he did talk about was the one involving the Japanese battleship Kirishima. The Washington sunk her with a good 22 heavy shells. It was the only encounter of that kind during the war and the Washington came out on top without a hit. As a kid, I was fascinated by the war for obvious reasons. To this day I continue to read and learn about all of the theaters of the war. I have profound respect for all the people who served. My parents lived in the east end of London during the war until they were bombed by a V1 in 1944 while my mum was pregnant with my brother. I have, what I think, a very interesting story about the aftermath of that incident that I’ll send you if you’d like to get an idea about attitudes of the common people at the time. Awesome work on he podcast. I really admire your passion for your subject and all the hard work and attention to detail you put into your podcasts. One of my grandfathers served in the Wehrmacht whilst the other finished the war as a Major in the British Army. I don’t know much about my German grandfather, as he was a quiet man and passed away when I was 7. He rarely talked about anything before his emigration to Australia in 1950. My English grandfather won the Military Cross in 1944 when he was crossing the Ems River. He never talked about the war much either, but I have his citations, his letter from King George VI and a photo of Monty pinning the medal on his chest. He passed away in 2001 when I was 16 and now my greatest regret in life is not getting to know my grandfathers better. It is crazy to think that they spent 6 years trying to kill one another. They were certainly a wonderful generation of people and your podcast is a great reminder of their struggles and the lessons that we must learn from their failures as well as their successors. Congrats on the great podcast – really enjoying the attention to detail. My father was too young to be in WW2 but was a telegram boy at East Sale Airfield in Victoria Australia. It was a RAAF training station and he had to deliver telegrams to wives and mothers living on or near base when they had been shot down or crashed ect. He is 85 now but remembers it with great emotion. My wife’s family is very different. Her Father in his 90’s was a forced laborer in Germany from Ukraine – he met and married a German woman (sadly deceased) who worked search lights in Frankfurt. They came as refugees and made a new life in Australia. The ripples of this and other conflicts impact upon us all, even today!! 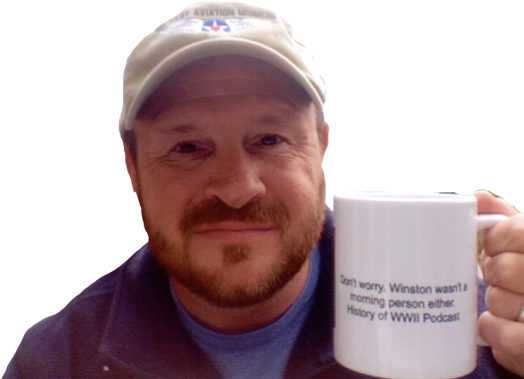 I hope you will consider the post war period in your podcast – the recovery is as big a story as the destruction!! I’m a huge fan of your podcast – currently at the Battle of Britain section. my Great-Granda was in the navy during the war, he was hit (and survived) by torpedo on two seperate occaisions! I wish I knew more about his story but he died before I was born. I grew up in Sunderland, North East England. a ship building and coal mining town that was bombed heavily during the war. I remember an unexploded bomb being discovered by workers 4 mile from my home – I couldn’t believe how loud it was from that distance when the army detonated it. it must have been horrible during a bombing raid when a llot more bombs were being dropped! I also remember a bomb bedded into the rocks on the coast where I lived. it had a big hole in it and was full of sand. We often used to go to see it as kids. Hello, I am sitting here with my 90 year old grand father. He fought in WWII under Joachim Peiper in the 1st SS Div. Leibstandarte SS Adolf Hitler. He has some VERY “interesting” stories (from a Nazi perspective) that you may want to hear. If so, please email me and I will arrange for you two to speak. Love your podcast!